Elmina fort and fishing harbour | Your Beach House in Ghana • Right at the ocean! 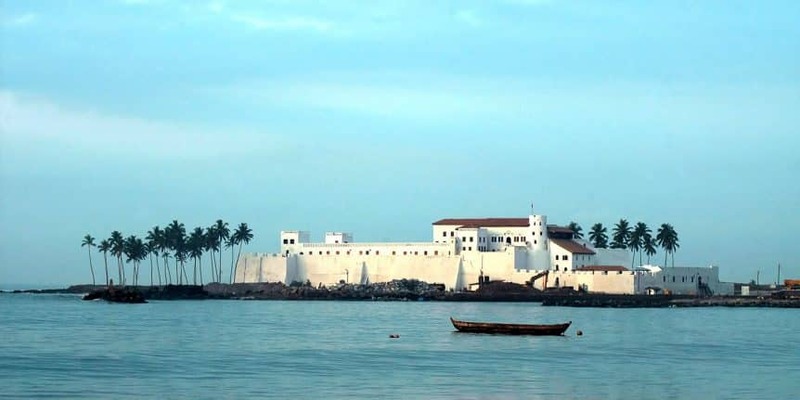 The St. George castle is a large fort located in the town of Elmina in the Central Region. There is a museum located in the castle that was set up through the efforts of various international organisations, as well as the Ghana museums and monuments board GMMB. The monumental structure now aims to make people aware and better informed of the slave trade and related history, plus of course the indigenous culture of the Central Region. The museum and the fort display a variety of photographs and pictures of the castle, as well as various items exhibiting trading with the foreign nations during the past 600 years. The tragic slave trade is the central focus. This also includes the role of indigenous slave raiders who assisted European powers in the days. Items such as shackles, ceramics, traditional beads, textiles etc. bring the day-to-day life, the slavery and fought wars to life. The St. George castles Tour is definitely recommended and allows you to catch a glimpse of the slave dungeons, the courtyard, The governor’s room, the chapel, the prisons (incl. the room where the Asante king & queen were held in order to be exiled to the Seychelles). The castle offers furthermore a great lookout upon the town, the fishing harbour, as well as the fort further up the hill; fort St. Jago. Elmina is a must see for all those interested in the history and culture of the Gold Coast.